Pretty stupid title, I know, but still, I’m happy to announce that my next submission was voted on interfacelift! I shot this picture while trekking through the Nepalese Himalayas, actually on a day hike close to the village of Manang, where I stayed for two nights to acclimatize to the respective altitudes I was about to face the next days. The colors of this little lake were simply amazing (no photoshopping here! 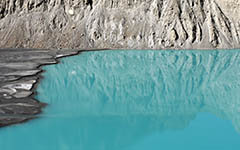 ), it was pond of collected melt water from the glaciers around. We, that was the Russians and myself, found great amusement by throwing big stones into this turquoise tranquility down there. Just for the sound of it. Again, almost 15,000 (!) downloads within the first two days, and counting. At least I think that’s quite amazing. Here’s the link to ‘Melting Earth‘. Echt a geiles Bild! Die Farbe vom Wasser is einfach hammer!